Stefano Romeo was born in 1819 in Santo Stefano di Aspromonte, a small village in southern Italy. He graduated in medicine. He was sentenced to death twice for his activity as patriot. He was in defense of Rome during the period of Roman Republic, afterward he went in Tuscany where he fought the Austrians who wanted to impose by force of arms the Grand Duke Leopold’s return. Stefano Romeo was forced into exile in Turkey where he stayed until 1860. When he came back to his country he was elected to first National Parliament and elected again for the second legislature. He carried out his political activity working with his friend Giuseppe Garibaldi whose he was maybe the doctor. He 1868 he resigned because he did not agree the way the constitutional regime was meant and implemented. 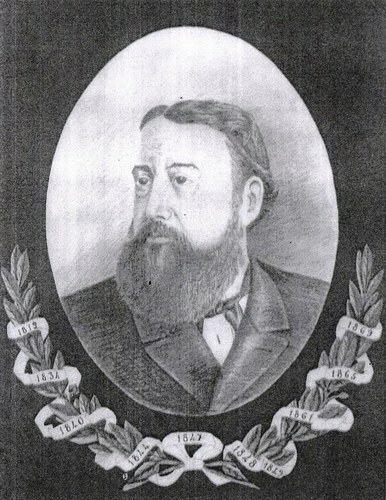 He died in S. Stefano in 1869. G.Musolino, S. Stefano in Aspromonte. Cinque patrioti, un ragazzo e la bandiera, Rexodes Magna Grecia, Reggio Calabria 2003, cap. III, pp. 91-141. G.Musolino, Santo Stefano in Aspromonte - Storia e protagonisti, Rexodes Magna Grecia, cap. II, p. 25.